Which cardstock or paper should I use? Sometimes when you come across the perfect inspiration for your next cardmaking project you’ll find yourself wondering which cardstock or paper to use. Which card and paper is the best for cardmaking? Which card is the best for making gift boxes? Which cardstock should I use for die-cutting? We’ve put together a guide to paper and cardstock to help you understand the properties and qualities you should look for when deciding on which cardstock or paper to use in your next craft project. Card or Cardstock – is there a difference? In the UK we tend to talk about ‘card’ when looking for what to make our handmade cards and crafts with. However, the word card means so many things, credit card, finished greetings card and of course sheets of card, so we use the term cardstock to make it clear we’re talking about the same thing. In the US you’ll find they always refer to cardstock. We use a standard range of sizes. 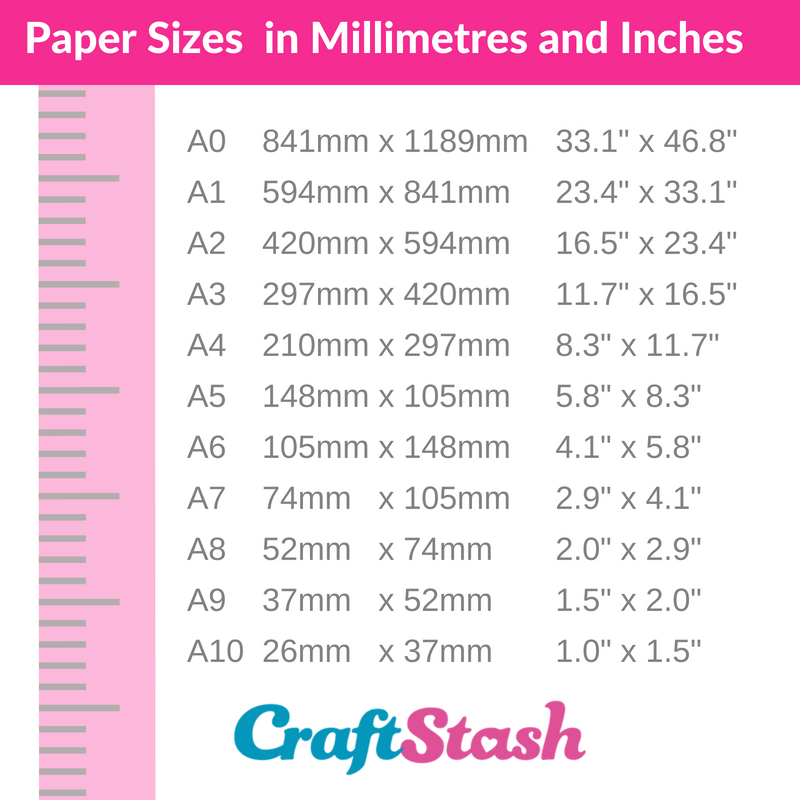 Most people are familiar with A4, it can be quite handy when buying cardstock to know the exact size. Why not pin this image to one of your boards or save and print it off so you’ll always know what every size measures exactly. Card and paper comes in various weights, usually measured in gsm. GSM stands for Grams per Square Metre and is how we measure the weight of cardstock in the UK. The higher the number, the heavier the card or paper weight. 70-100gsm – this is copier paper weight, the kind used in your office printer or that you will find most business letters are written on. 90gsm is a standard weight for stationery. You can still get it with a nice luxury finish if you had inserts for wedding invitations for example, so don’t assume it’s always cheap. 100-170gsm – anything above 100gsm moves from being called paper to being a light card. You will find uses for light card like this for layering and matting. Lots of people like this weight for easy die-cutting and also for printing backing papers. 170-220gsm – as above, this weight of card is ideal for layering and matting, die-cutting and printing. You may find they work well on single layer cards, however if you add layers and embellishments this cardstock weight may buckle and not look great when displayed. 280gsm – 350gsm – Getting thicker! This kind of weight is great for a more luxury effect and a far sturdier base. 280gsm is a very popular weight for cardstock used in cardmaking. Many people would use thicker card, 300gsm and above for 3d projects like making card boxes or gift boxes. Luxury wedding invitations should also use either one thick piece of cardstock, or be layered up to create a heavyweight, more expensive and high-quality feel. Not only does cardstock come in various weights and sizes it also comes with lots of lovely different finishes. 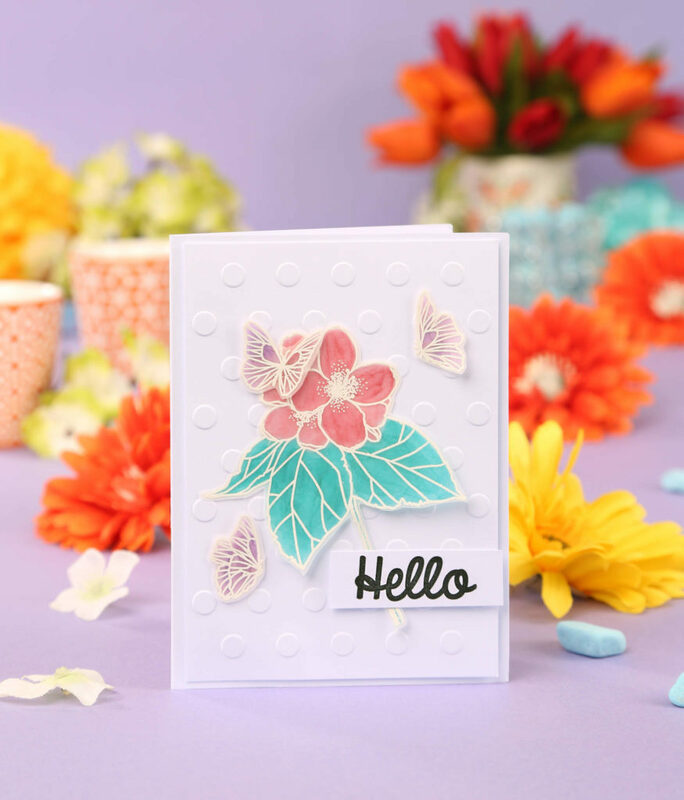 It’s well worth trying different cardstock textures and finishes to achieve lots of creative effects with your cardmaking. Embossing and die-cutting can take on an entirely new look when using different kinds of cardstock. As the name suggests you can buy cardstock which has a smooth untextured and uncoated surface in a multitude of colours. Perhaps the most commonly used in cardmaking as it’s a blank canvas! many people buy lots of white plain cardstock for bases and cardblanks. Look out for whether the colour is on both sides and how it folds. Some card has colour all the way through, while other cardstock will show unsightly cracks when folded. Hunkydory Adoreable Scoreable range prides itself on not cracking even with deep scoring. This is a shiny card with a highly reflective metallic finish, just as you’d expect from the name. It looks great when die-cut to add little sparkly elements to your card and is of course a must have when it comes to Christmas cardmaking. Some mirri cards have an almost holographic effect, creating little rainbows as they catch the light. Glitter cardstock is coated on one side with lots of glitter! Use as a background or for die-cutting to add little sparkly details to your work. The amount of glitter various from a subtle sparkle through to a fully loaded glitterfest of card! You would describe pearlescent card as having a lustre rather than being shiny, think of ‘Mother of Pearl’ it comes in many different colours and is very popular as a cardtock and paperweight. Especially popular for wedding stationery where a little subtle sheen will catch the light and add another layer of interest. Gold, silver, copper, bronze, rose gold – you can find metallic looking cardstock perfect for your craft or cardmaking project. Crafter’s Companion Centura range has some beautiful heavyweight 310gsm metallic card that we’d thoroughly recommend with lots of 5 star reviews on our website. Embossed and textured cardstock features a beautiful embossed finish, popular embossed finishes are linen embossed (woven texture), hemp embossed (like old hemp / hessian sacks) or a hammered cardstock finish (looks just like it’s had little hammers bashing it). Most embossed card is made by passing the card through a large (usually industrial size) mangle, where the top roll has the pattern engraved, the paper is put under extreme pressure to achieve a beautiful and consistent finish. All of these finishes add those extra special details and make great card bases and wedding stationery. Take a look at our Craft UK range for a great selection of embossed card. Patterned paper and cardstock gives you a great starting point for your cardmaking and crafts. Often used in scrapbooking, you can sheets or pads in size 12 x 12 or A4 pads. the great thing about patterned paper pads is that they coordinate with each other, not the same but they’re designed to a theme which can really help with creating themed scrapbook pages or craft projects where all the various items, envelope, cardbox and card for example match each other. Foiled cardstock is a patterned cardstock but usually has a plain base colour and then is foil embossed with a pattern. 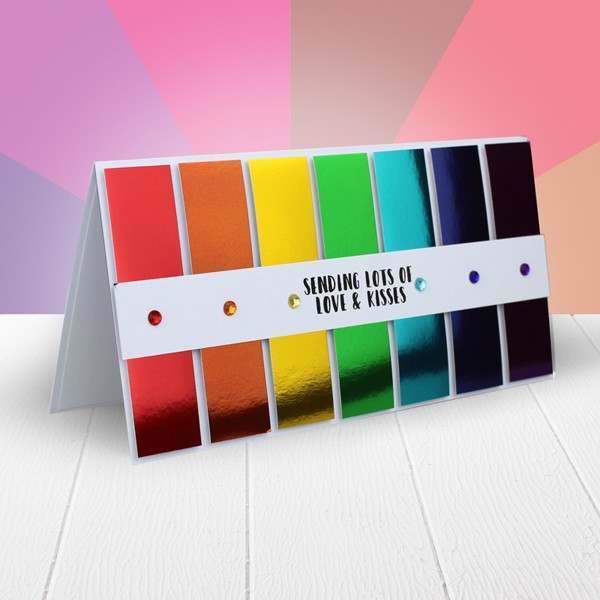 Adds a very luxurious feel to your work, ideal for wedding stationery and dramatic cards. 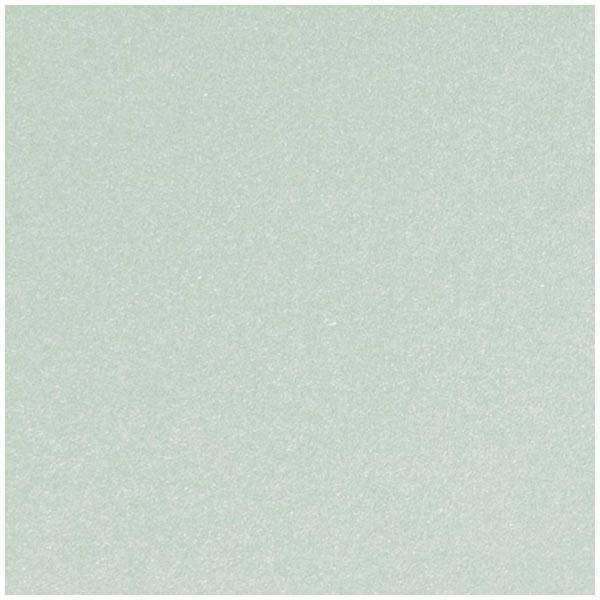 A really popular colour and texture cardstock or paper for rustic craft projects, cards and stationery. With a rough finish, Kraft card is made from recycled paper and so is a great environmentally friendly option, ideal for gift tags. Vellum and parchment are thin transluscent papers that can add a wonderfully luxurious finish to your work. there’s something very traditional about vellum that reminds you of antiquated books, however you can die-cut and colour vellum with great modern effects. Butterfly wings look stunning die-cut from vellum. You’ll all know what tissue paper is! We love all the gorgeous paper flowers you can find on Pinterest made with tissue. This very lightweight paper can can also be used for decouping and adding to collages, pinted tissue paper is great for multimedia cardmaking or craft projects. You can also use tissue for adding inside gift boxes or wrapping up little handmade gifts.